Malignant mesothelioma is an aggressive cancer that arises from mesothelial cells, which make up the normal lining of the pleura, pericardial, and abdominal cavity. Mesothelioma is an uncommon malignancy, with an incidence rate of less than 1 case per 100,000 population. Pleural malignant mesothelioma is more than twice as common in men as in women. The pleural space is the most common location for mesothelioma. The tumor lines the chest cavity along the pleural space and can surround and encase the lung. Tumor can also involve the pericardium as either a primary or secondary site. Mesothelioma can also occur in the peritoneal space and in the tunica vaginalis, all mesothelial-lined structures. Patients with pleural mesothelioma often present with respiratory complaints (dyspnea), which can be related to pleural effusion in many cases. Chest pain can also be a presenting symptom. Some patients are asymptomatic with an incidentally discovered effusion. Physical examination findings, when present, generally relate to pleural effusion. Various methodologies can be used to image the chest in malignant mesothelioma. Chest radiography may be useful in identifying pleural effusion, and masses/pleural thickening can be suggested with this method. CT scanning can better delineate and more accurately define the changes seen on chest radiography, including pleural thickening, pleural effusion, and reduced lung volumes. MRI may also be useful. Positron emission tomography (PET) scanning has been used to assess the extent of disease. For more, see Malignant Mesothelioma Imaging. 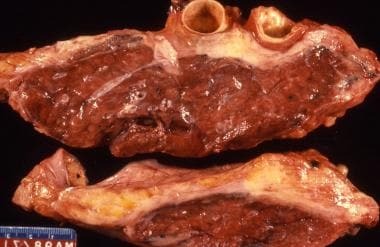 The classic description of malignant pleural mesothelioma is a thickening in the pleural space with encasement of the lung by a rindlike visceral pleura (see image below). Figure 1 – An autopsy lung case with diffuse thickening of the pleura causing compression of the underlying lung tissue. The tumor can form additional small nodules over the diaphragmatic surfaces or other less involved areas in a given case. Hyalinized pleural plaques, which are white platelike thickenings over the parietal pleura and diaphragmatic surface, can become invaded by mesothelioma. Rare cases of malignant mesothelioma are characterized by a single mass lesion without the diffuse thickening or satellite nodules. This is called localized malignant mesothelioma. The major growth patterns of malignant mesothelioma are epithelioid and spindled. 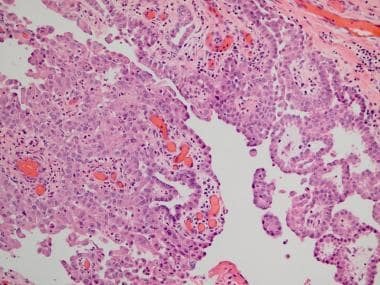 Tumors of pure epithelioid histology can have patterns described as papillary (cells growing along exophytic fronds with vascular cores), tubulopapillary (a mixture of glandlike formations and papillary structures), and solid (see image below). 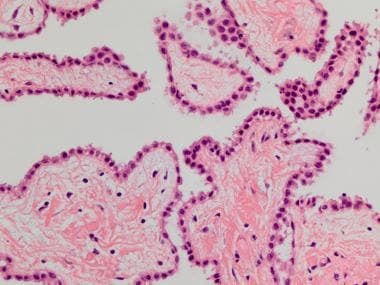 Figure 2 – This histologic section stained with hematoxylin and eosin shows papillary structures on the right and a transition to a more solid pattern on the left. The cells of mesothelioma often have deceptively uniform nuclei with moderate amounts of cytoplasm; the mitotic rate is often low. These are factors that can make cytologic detection of disease especially difficult and can result in significant diagnostic challenges in tissue samples of reactive pleural conditions. Histologic variants of malignant mesothelioma, epithelioid type, include cystic growth patterns and cells that resemble decidual cells and variants that resemble small cell carcinoma. Some cases can have abundant extracellular matrix, and rare cases can produce intracellular mucin. Well-differentiated papillary mesothelioma represents a proliferation of bland mesothelial cells along fibrovascular cores (papillary architecture), and they are often incidentally discovered growths in the abdominal cavity, although they can also occur in the chest. These are more common in women and are not associated with asbestos exposure. These can have superficially infiltrative growth, but not deeply invasive growth into skeletal muscle or fat, and can be multifocal. While they can recur, these proliferations generally have a very indolent behavior (see image below). Well differentiated papillary mesothelioma is characterized with a single layer of bland cuboidal cells lining fibrovascular cores, as demonstrated in this image. Benign cystic mesothelioma is composed of multilocular, sometimes multifocal, mesothelial cysts lined by flat to cuboidal mesothelial cells. They occur more commonly in the abdomen but can be seen in the chest. They may be associated with prior surgery. While these lesions can recur, only very rare cases have been associated with subsequent mesothelial malignancy. Fibrous mesothelioma is an obsolete term used to describe a solitary fibrous tumor not of mesothelial origin. This does not refer to sarcomatoid mesothelioma. 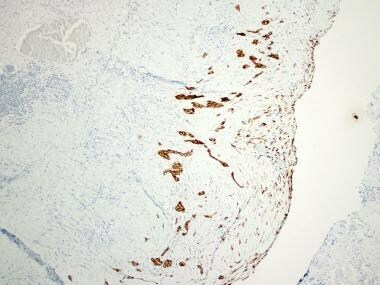 The diagnosis of malignant mesothelioma is confirmed using immunohistochemistry tests. As the differential diagnosis is often with adenocarcinoma, a combination of markers indicating mesothelial origin and antiepithelial origin are used. Markers of mesothelial differentiation include calretinin and WT1 (nuclear), as well as cytokeratin 5/6 and D2-40 (podoplanin). None of these markers is sufficiently sensitive or specific to be used alone; a minimum of 2 mesothelial markers is recommended, although more are needed in some cases. Markers of carcinomatous differentiation include MOC31, BG8, CEA, CD15, B72.3, and BEREP4. Again, none of these markers is sufficiently specific for adenocarcinoma to be used alone; a minimum of 2 carcinoma markers is recommended, and many cases require a larger panel. Since lung adenocarcinoma is often among the differential diagnoses, thyroid transcription factor 1, which is positive in lung adenocarcinoma and negative in mesothelioma, can be helpful. Other markers of potential use include PAX8 to distinguish mesothelioma from renal cell carcinoma and female genital tract adenocarcinoma and p63 to distinguish from squamous cell carcinoma. The cytotoxic effect of asbestos on cells and the subsequent effects on cellular survival have been implicated in the pathogenesis of malignant mesothelioma. Specifically, generation of reactive oxygen molecules has been shown to cause DNA damage and activation of NFKB and AP-1 pathways found to enhance cellular survival. Interestingly, activating oncogenic mutations (eg, EGFR, KRAS) have not been described in mesothelioma, and mutations otherwise commonly seen in solid tumors, such as p53 mutation, are not described in malignant mesothelioma. The molecular pathogenesis of mesothelioma surrounds loss of tumor suppressor gene function, often by deletion. NF2 losses are the most common alterations in malignant mesothelioma, and resultant loss and truncation of merlin (NF2 protein) is seen. Frequent deletion in chromosome 9p21 leads to loss of p16 (cdkn2a) and p14. These two losses affect two critical tumor suppressor pathways of Rb and p53. Recent data have shown that mutations and deletions in BAP1 (BRCA-1 associated protein 1), a putative tumor suppressor gene, are also implicated in rare uveal malignant melanoma. Pleural mesothelioma is typically a unilateral disease that begins on the parietal pleura. As tumor progresses, it extends to the visceral pleura and into the underlying lung parenchyma. It can also involve the diaphragm. The tumor can also extend into endothoracic fascia, mediastinal fat, chest wall, and pericardium, all of which are considered locally advanced but resectable. However, multifocal involvement of the chest wall, transmural pericardial extension, extension into the abdomen, contralateral involvement, spine involvement, and involvement of major mediastinal structures are all advanced local disease. Nodal disease can be seen in the bronchopulmonary, hilar, and mediastinal lymph nodes. The TNM system reflects these features, with T stage increasing with involvement of visceral pleura (T1b), diaphragm and lung (T2), and locally advanced disease that can be resected (T3). Locally advanced disease that is unresectable is designated as T4. The median survival of pleura malignant mesothelioma is just over one year, with a 5-year survival rate under 10%. Favorable prognostic factors include epithelioid histology, young patient age, favorable patient condition measured by performance status, and lower stage. Immunohistochemistry helps to demonstrate that the atypical mesothelial cells in this reactive proliferation are in fact in one roughly linear layer, an important criterion supporting a benign process. Well-differentiated papillary mesothelioma needs to be distinguished from malignant mesothelioma, epithelioid type with papillary pattern. Extent of disease, size of tumor masses, nuclear grade, necrosis, and pattern of invasive growth can all be used in this setting. SELIKOFF IJ, CHURG J, HAMMOND EC. ASBESTOS EXPOSURE AND NEOPLASIA. JAMA. 1964 Apr 6. 188:22-6. [Medline]. Jasani B, Gibbs A. Mesothelioma not associated with asbestos exposure. Arch Pathol Lab Med. 2012 Mar. 136(3):262-7. [Medline]. Malpica A, Sant'Ambrogio S, Deavers MT, Silva EG. Well-differentiated papillary mesothelioma of the female peritoneum: a clinicopathologic study of 26 cases. Am J Surg Pathol. 2012 Jan. 36(1):117-27. [Medline]. Attanoos RL, Gibbs AR. Pseudomesotheliomatous' carcinomas of the pleura: a 10-year analysis of cases from the Environmental Lung Disease Research Group, Cardiff. Histopathology. 2003 Nov. 43(5):444-52. [Medline]. Klebe S, Brownlee NA, Mahar A, Burchette JL, Sporn TA, Vollmer RT. Sarcomatoid mesothelioma: a clinical-pathologic correlation of 326 cases. Mod Pathol. 2010 Mar. 23(3):470-9. [Medline]. Cagle PT, Churg A. Differential diagnosis of benign and malignant mesothelial proliferations on pleural biopsies. Arch Pathol Lab Med. 2005 Nov. 129(11):1421-7. [Medline]. Churg A, Colby TV, Cagle P, Corson J, Gibbs AR, Gilks B. The separation of benign and malignant mesothelial proliferations. Am J Surg Pathol. 2000 Sep. 24(9):1183-200. [Medline]. Rake C, Gilham C, Hatch J, Darnton A, Hodgson J, Peto J. Occupational, domestic and environmental mesothelioma risks in the British population: a case-control study. Br J Cancer. 2009 Apr 7. 100(7):1175-83. [Medline]. Wilson GE, Hasleton PS, Chatterjee AK. Desmoplastic malignant mesothelioma: a review of 17 cases. J Clin Pathol. 1992 Apr. 45(4):295-8. [Medline]. A solid pattern of mesothelioma on the right of this histologic section transitions to a spindle cell morphology on the left of the image in this predominantly sarcomatoid malignant mesothelioma.